A view of the on/off key on the Pertec / MITS 8800b Turnkey model. The system required some minor repairs, a short was detected in the turnmon board preventing I/O from the Turnmon board. I repaired some burned out traces and set the baud rate to 9600. 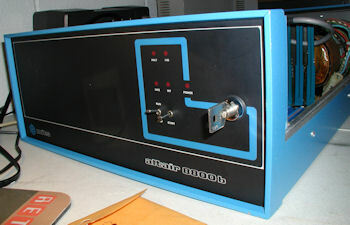 View of a repaired turnkey "turnmon" board. Note S0, S1, and S2 are jumpered to produce 9600 baud. S0 required minor repair, some of the original trace metal was lost. The staining is only cosmetic. Click image for larger view. Repairs completed. Here is a view of the Turnmon monitor program display of the first 8 bytes of RAM. The memory is displayed in octal. Next project, add ROM board with Altair BASIC that can be called from the monitor prompt. Step One - Extract a memory dump from system booting from BASIC disk, see if disk basic can be "planted" into RAM without interfering with the TURNMON. If that works, burn the memory to ePROMs. Need also to locate jump point to start BASIC from TURNMON. I loaded extended altair basic 4.1 into memory, from disk, onto my turnkey system. Then I wrote a BASIC program that dumps the first 32K of RAM, one line at a time (octal instructions) to the screen. I can use Teraterm to capture the screen output of the program as a log file. The BASIC program will format the screen output to simulate a turnkey script. 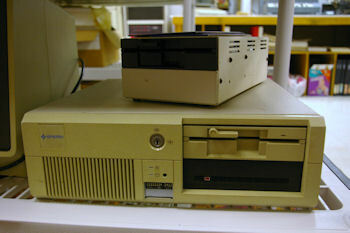 Let's say I have no disk drive but I do have an Altair turnkey system with 32k. I can take my log file script and use TeraTerm's Send File function to download the file and simulate keystrokes at the turnkey monitor prompt. I would need to use a 32mS delay so as not to overwhelm the Altair. It would be not much faster than papertape. In theory once the memory has been installed I can simply pick up from where the source computer started. If so, I'd just hit enter 2x to get an OK prompt...I may have to play around with the code to make it work, set ports, etc. 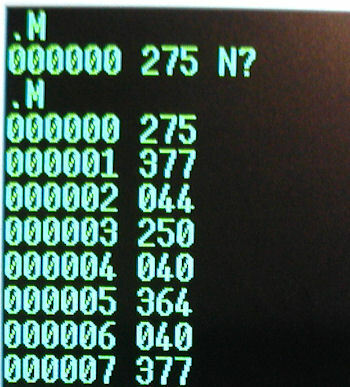 Because this is a memory snapshot the BASIC program that generated the OCT (or HEX) listing may also still be in memory as the active program (type LIST). If so it would be easy to run the memory dump program again and compare the RAM values with the original and to look for errors, etc. Jumping to 0000 may be necessary to get BASIC to run but there is a risk. Jumping to 0000 may flush the scratchpad memory used by BASIC and whipe the memory dump program from memory. NOTE: After you create the log file, you need to remove all carriage return line feed chars from the text file. You end up with a huge one line text file that can be read into the MITS Turnmon program. If it works, I will post. The technique works, but you have to load well into 040000 (24K) which takes well over an hour because you must use a character delay to simulate keystrokes, but not too fast. 2) Run the loader, "J040000"
MY NOTE: TYPE THIS EXACTLY, NO SPACE OR ENTER AFTERWARDS! 4) After the file is sent, RESET. run from zero...."
NOTE - You may have to change the terminal to use N/7/2 after loading and the MEMORY SIZE? appears,etc. You can also run BASIC from the Vector Graphics monitor for MITS Turnkey, an alternative monitor program I found. No documentation on this version exists on the web, but you can search Google for "Vector Graphic Extended Monitor" to locate newer versions of the docs. Unike the MITS TURNMON, The Vector Graphics (1.0?) monitor prompt is the asterisk character (*). Interestingly the prompt changes to the dot (.) prompt when using the Vector Graphics ROM in Program (P) mode. After you enter the last value, hit enter, and then hit Esc to return to the asterisk prompt. Using your terminal program 9600/8/n/1 Download EXBAS.BIN as a binary file. When the file finishes press down on the START switch on the front panel to return to the asterisk prompt (*). You should be greeted by the MEMORY SIZE? prompt.